Vehicles can qualify for one of the awards with either a good or acceptable rating in the small overlap front crash test, along with good ratings in the other four crashworthiness evaluations. In addition, Top Safety Pick+ winners must have an advanced or superior rating for front crash prevention. The industry ministry said Thursday it has succeeded in obtaining samples of sea-bottom soil that contains methane hydrates, seen as a next-generation domestic energy source, in a survey off the country’s Sea of Japan coast. Organizer: SENKEN SHIMBUN Co, Ltd. / ICS Convention Design, Inc.
WASHINGTON — The F-35 Joint Strike Fighter program has selected Japan and Australia to provide heavy airframe and engine maintenance in the Pacific, the Joint Program Office announced Wednesday. With this module, Sony has achieved a compactness of size and a lightness of weight that make it possible to attach the module to a piece of eyewear. TOKYO—Toshiba Corporation today announced that it has opened the Healthcare Technology Center in the Komukai Complex in Kawasaki city, Kanagawa prefecture today. The center is established for the purpose of expanding the healthcare business under the medium-term management plan, and will serve as a base for the development of next-generation products as well as research and development of differentiating technologies on mid- and long-term basis. HIROSHIMA, Japan—Mazda Motor Corporation has announced that, in conjunction with Mitsubishi Chemical Corporation, it has developed a new bio-based engineering plastic that can be used for exterior design parts for automobiles. Apple confirmed Tuesday that it would open a new research site in Japan after Prime Minister Shinzo Abe boasted on the campaign trail that the U.S. tech giant planned to step up its investment in the country. TOKYO — With more Japanese beef being sold abroad than ever before, meat distributors are hoping foreigners will hanker for the premium cuts that penny-pinching domestic consumers pass by. A Japanese Air Self-Defense Force aircraft has left for Ghana to transport protective clothing to help West African countries fight the Ebola epidemic. The latest Manufacturing and SMT technologies which enables greater functionality and higher performance of electronics products will gather under one roof! The dollar has briefly climbed above the 120-yen level. This is the first time in about 7 years and 4 months the US currency has entered that trading band. Mitsubishi Heavy Industries, Ltd. and the Japan Aerospace Exploration Agency (JAXA) successfully launched the H-IIA Launch Vehicle No. 26 (H-IIA F26) with the Asteroid Explorer “Hayabusa2″ onboard at 1:22:04 p.m. on December 3, 2014 (Japan Standard Time, JST) from the Tanegashima Space Center. Hyderabad, Dec 1 : Andhra Pradesh will have Japan’s imprint on development in various spheres, particularly in building the state’s new capital, if plans drawn out by the TDP-led Government fructify. Dentsu Inc. announced today the release of its “2014 Hit Products in Japan” report. Produced as part of a series that has been chronicling hit products since 1985, the latest report examines major trends that represented the consumer mindset in 2014. It is based on an Internet survey of Japanese consumers carried out in November 2014 by Dentsu Macromill Insight, Inc.
Today, FutureBrand reveals its latest ranking of the world’s leading country brands. Asia tops the Country Brand Index (CBI), with Japan at number one for the first time in the report’s history. UNESCO has decided to add the traditional techniques of crafting Japanese-style “washi” paper to its list of intangible cultural heritage. A UNESCO intergovernmental committee made the decision at a meeting held at the organization’s headquarters in Paris on Wednesday. TOKYO — Japanese exports are increasing as the impact of the falling yen finally starts to emerge via lower prices for goods sold overseas. The Cabinet Office said Thursday that the seasonally adjusted export volume index for October came to 92.7, up 2.2% from September and the second straight month of gains. The index hit its highest level since June 2012. The benchmark of 100 is set at 2010 levels. TOKYO (Kyodo) –Tokyo stocks edged higher Friday on investor hopes for a release of fresh economic policies by Prime Minister Shinzo Abe later in the day in the wake of the dissolution of the lower house. 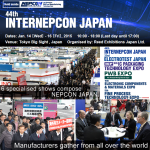 SEMICON Japan exhibitors represent the leading manufacturing technology companies covering the spectrum of the microelectronics industries with regular exhibiting zones and technology and market focused pavilions.